By the fourth century, B.C.E., when the Jews returned from Babylonian exile to build the second temple, Rosh Hashanah was well established. By the time of the Mishnah, the codification of Jewish oral traditon, Rosh Hashanah had developed a more serious tone. Now, having suffered the loss of the second temple, Rosh Hashanah emphisized the anniversary of creation, and of G-d as judge, dispensing mercy or justice to those who do or do not repent their sins. 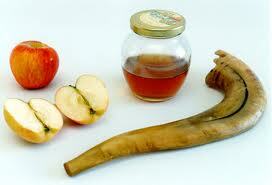 The Torah refers to Rosh Hashanah as Yom Teruah, the day of sounding the shofar, the traditional ram’s horn. It is also called Yom Ha’Din, the day of judgement as well as Yom Hazikaron, the day of remembering. Yom Hazikaron is a reference to the patriarch Abraham who offered his only son, Isaac, to G-d as proof of his obedience. As the result of his readiness to sacrifice Isaac, G-d caused a ram to appear and be killed instead. According to Jewish tradition, this sacrifice is believed to have occurred the first of Tishri.